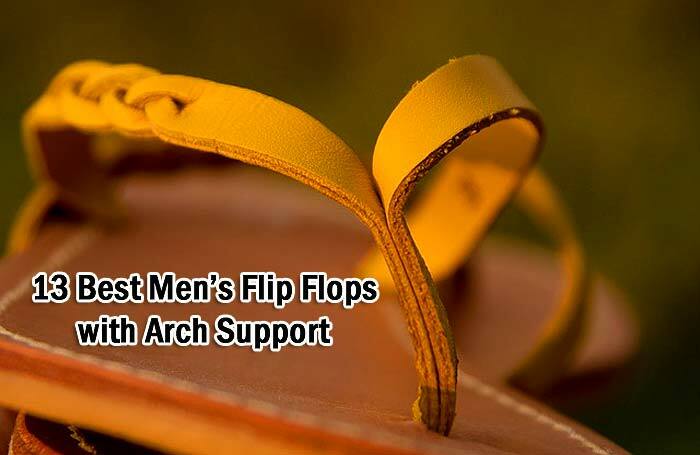 Best Mens Flip Flops with Arch Support: During the summer nothing helps to evoke comfort and a sense of chill vibes like a pair of flip-flops. Flip-flops are great for backyard parties, walking around the house, or when you are heading to a sandy beach somewhere far away. Also, coping with plantar fasciitis and the heel pain that accompanies it is a nightmare especially for those who have to be on their feet for a long period. Many people want to get rid of this undesirable feeling, hence the need to buy these flip-flops with arch support. This type of flip-flops provides the right amount care for those people that spend long hours on their feet. Finding the best men’s flip flops with arch support can be hectic but the results are usually worth the effort and time. To help reduce the stress of sourcing for the best flip flops, we have compiled a list of the best products on the market. The first men’s flip-flops with arch support is a collection of health-oriented footwear and sandals from Olukai. 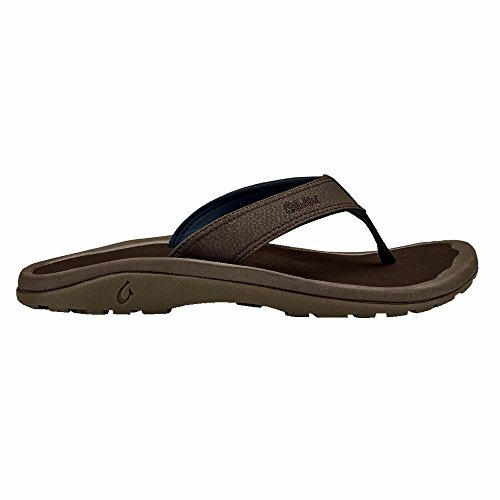 This is a water resistant and multi-purpose sandal with a great style and comfort. 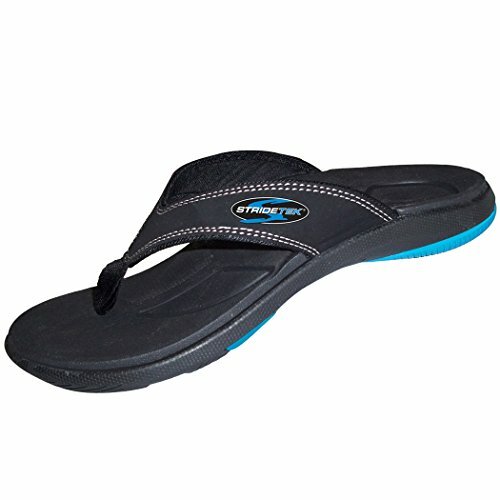 The upper strap and rubber sole of this flip flop is made of high-quality synthetic leather. It has neoprene foam and jersey knit lining at the back gives additional support and protection for sore ligaments. The deeper automatically contoured design of this product ensures it feels superb and fits comfortably. It has soft nylon toe post webbing that works well for comfort levels especially for those with painful heels. This flip-flop is available in sizes 7M to 18M. With this flip-flop, you need not worry about any ‘flap’ sound common with most sandals. It has a superbly contoured heel cup, a rubber sole, and it is water resistant. The footbed of this product has impeccable traction, and it is designed to absorb shocks and resist flipping. This is one of the best men’s flip flops with arch support and it is popular among those who enjoy taking part in water-related activities. It is very durable and it will help to provide relief from heel pain. It is available in sizes 5M to 12M. Vionic specializes in the production of footwear that assists with motion control and they are a leader in the foot health industry. This flip flop is considered as one of the technical flip-flops for men. It has a triple-density EVA sole that gives great cushioning and stability for the ligament. The VIBRAM outsole of this product ensures you have impeccable traction, and it helps to reduce stress on the ankles, knees, and feet. Although this flip-flop is more expensive than its alternatives, its benefits will compensate for this. Your feet will feel comfortable and look good wearing this. Vionic men’s Bryce is available in different sizes from 7M and 8M only. A podiatrist designed this flip flop and it provides the needed arch support. It has a foam-lined strap and a cushioned soft toe that helps to increase comfort level while also reducing the risk of foot irritations. The adjustable straps and rubber sole give it a casual look. It has a great cushioning, impeccable traction, and high comfort levels. It is available in different sizes from 7M to 14M. 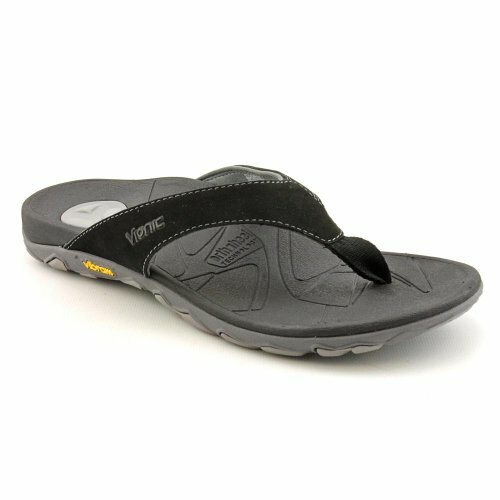 This flip-flop has all the benefits of a typical orthotic shoe with its user-friendly style and added comfort. It has a sturdy rubber sole thread that provides durability and superior grip. It has a revolutionary design with its integrated footbed unit that provides protection from pronation which is a major problem with traditional flip-flops. It molds superbly with its arch shape and it helps with the foot natural alignment. It has a deep heel cup that helps to stabilize the foot from lateral movements. This product is great for relieving plantar fasciitis, common foot pain, heel pain, and arch pain. 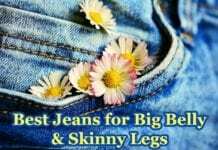 It is available in different sizes from size 4 to 16. These mens flip flops are made from orthotic conforming lightweight synthetic foam. It comes in a variety of color options to meet your fashion needs. It has an ergonomic and textured footbed that provides slip resistance and ample arch support. It has amazing grip traction, and it contains the needed guidance measure to help control and support pronation concerns. It features an Oofoam Recover Technology that absorbs more than traditional footwear from material to help reduce stress on the feet and joints. Oofos flip flop is available in sizes 3M to 14M. This sandal is made of mesh and synthetic materials for high durability. It has a high-density sole that provides ample arch support and stabilization. The grip threads on this product make walking a breeze. The super soft contoured foam footbed provides instant comfort. The molded footbed is designed with anatomical arch support to comfort you all day long. It is made with ultra-soft water-friendly materials that handle splashes well. It has a grippy molded and durable high-density EVA outsole. It is available in different sizes from size 7 to 14. 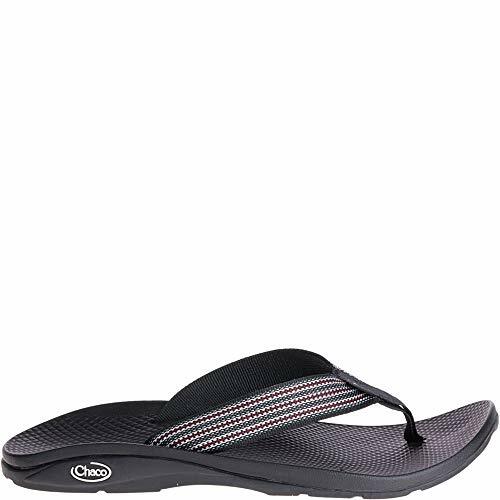 This men’s flip-flop has a nicely contoured folded footbed that gives great support and comfort. It is a full-grain leather with canvas edged uppers and it is available in neutral colors. It has built-in motion control and shock absorption that helps to control all pronation issues. This product has a unique grip sole that ensures your last step is safe and secure. The contoured arch support and deep heel cup offer additional stability and alignment. The metatarsal arch support helps to ease forefoot pain. This product is good for those suffering from plantar fasciitis and it has been accepted by the APMA (American Podiatric Medical Association) for better arch support. It is lightweight, and it has an orthopedic footbed that gives your feet great support. The heel cup gives its users lots of heel support. The SOLE flip-flops have non-marking outsoles and a great cushion pad in the forefoot. They are waterproof and are made from highly durable material. It has an ergonomic footbed that contains a metatarsal pad and platform that allows for quicker recovery after exercise. It is designed specially to conform to your feet so it can provide the necessary arch support. They are available in 3 different colors and different sizes from 9M to 14m. This flip-flop has amazing traction on the bottom and an incredible footbed for comfort. It has a crafted strap that gives support and superb comfort to its users. This flip-flop has an awesome design and style for comfort and adventure. 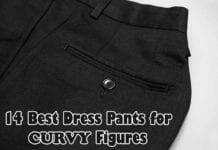 It is available in black and grey color to suit your fashion needs. It is available in different sizes 7M to 12M. 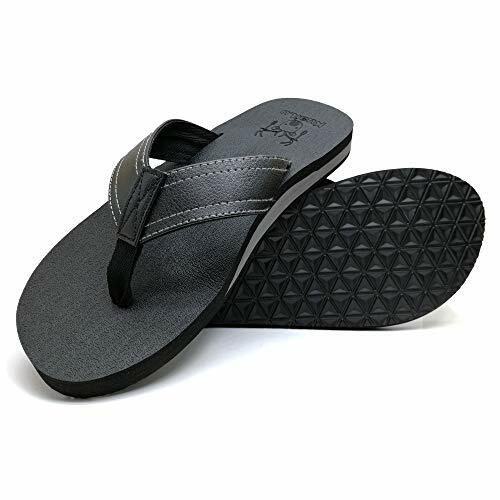 These sandals are REEF’s best-selling men’s flip flop with arch support. It is handcrafted, and it has anatomical arch support and comfortable footbed. It has a church key bottle cap opener integrated into the rubber outsole. It has a contoured EVA foam footbed that helps to absorb shock. It has a soft and comfortable upper strap. It is available in 11 different colors and sizes 4M to 17M. This sandal is designed to mold to your feet to avoid the flip-flop motion that is bad for foot structure. It has a raised tip that helps to avoid toe stubbing. It has heel cups that help to prevent heel strike. It is made from durable high shock-absorbent materials and the sole grip helps to reduce the risk of slipping. It has a high arch support that preserves the foot structure while also preventing curvature of the spine. The metatarsal support helps to promote good posture, and it leads to limb balance. It is available in from size 4 to 12. 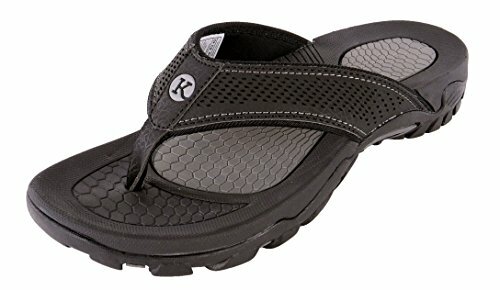 The KuaiLu men’s flip flop for better arch support is made from TPE foam and it offers a lightweight and comfortable feel when you are walking. The strap has an inner fabric lining that is soft and comfortable. The extra layer between the footbed and outsole gives its users a comfortable feel every time. It has a shock absorbing sole that provides flexibility and cushioning. The high bounce back sole helps to maintain the original shape. These flip-flops are not slippery even when it is wet thanks to the grip in the sole. It is available in different sizes and colors to suit your preferences. So, whether you are running errands in your local supermarket, hitting the beach or it is just a little stroll outside your home, choosing a flip-flop sandal with arch support is a good way to relieve the dreadful plantar fasciitis and heel pain. Anyone of the flip-flops we have selected will provide you relief from any foot pain you may deal with. “Plantar Fasciitis: Symptoms, Causes, and Treatment”. Accessed February 04, 2019. Link. “How Pronation, Overpronation, and Supination Affect You”. Accessed February 04, 2019. Link. “Three Arches of the Foot”. Accessed February 04, 2019. Link. Previous article12 Best Obnoxious Golf Shirts That Blow You Away!